2014 Calendar gives you a chance to plan ahead and stay ahead. The calendar 2014 is structured keeping in mind everybody's requirement irrespective of region or religion. Like wise, 2014 Calendar will give you an idea of the holidays lined up, which will give you that extra boost to execute your work more efficiently. And, with this 2014 calendar you will be able to finish things in the desired time window. Calendar, whenever you hear this word, you get a feel of being organised. Without the help of Calendar 2014, a majority of the working class crowd will find it absolutely chaotic to keep track of their work waiting for them in the year 2014. Calendar 2014 helps to keep a track of the events happening in our life; like, birthdays, anniversaries, wedding days and so on. 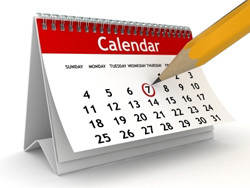 Adding on to the usefulness of calendar for 2014 is an example - It will be a sheer waste of money and time if you purchase a gift for someone whose birthday or any special day for that matter is already over. Would'nt that be a bummer! So its in your hands to not let that happen with your loved ones. When our 2014 calendar has come to your rescue, let's make this a special year! India is a country with a rich cultural background. With its multilingual people, different religions and customs, the basket is full of events and festivals. Our Indian Calendar 2014 will help you follow and witness the unity in diversity of India. Islamic Calendar 2014, also known as Hijri Calendar or Muslim Calendar, will give you a thorough information of all the events taking place in the year 2014. Islamic festivals are celebrated by Muslims and Islamic calendar 2014 provides you with the holidays and festivals of the year 2014. There may be slight variations in the dates, as the dates are determined by the lunar calendar. Chinese, is a community which is just as rich in culture and tradition like we Indians. Their spring festival, lantern festival and blue dragon festival, to name a few are very famous and even followed by many non-Chinese people. With our Chinese Calendar 2014 you can know more about their ways of celebrations and even do a bit of celebration ourselves. AstroSage's Hindu calendar 2014 will give you the detailed information of the events that take place every month. As Hindu Calendar 2014 is based on astrological factors, every year the dates of the festivals change, unlike the ones which have a standard date every year. As such, following a Hindu Calendar would be the best way to know about your festival and celebrate with everyone. There are many festivals happening every year, most of which come to attention without any trouble, but the ones happening every month miss our attention. Though they be small events, they are just as important as the big festivals, as such one should not miss out on these. Like the monthly Chathurthi, Pradosham and Vrat; with our Hindu Calendar 2014, you will be able to observe each and everyone of them without fail. Further, with the help of our Hindu Calendar 2014, you can also keep track of the important Muhurats to perform any auspicious occasion. Many would have experienced the situation of being asked to "block the calendar" and doing that will be a lot more easier, when you have an idea of what is already there in that calendar. With the help of AstroSage's Calendar 2014 at your reach, you can confidently give your dates to your loved ones without any hesitation. Adding on, anyone who finds out that there is a holiday waiting for them at the end of the week will get more energized than a drink of red bull would make them. For example, with the help of our 2014 Holiday Calendar you can plan your holidays and give your kids and family the best holiday ever.